This weekend the University of London Boat Club competed at the Senior British Rowing Championships in Nottingham. ULBC only raced the Eights and Quads events on the Sunday of the regatta but U23 silver medalist Richard CLARKE raced the Saturday in a composite four with three fellow 2015 U23 World Championship athletes from other programs. They took the pennant for the fastest U23 four, and finished as the 5th fastest four of the day, not far behind many established senior GB athletes. 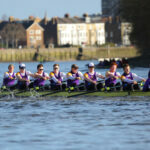 On Sunday ULBC arrived, with many athletes rowing in Purple for the very first time. Four men’s eights, two women’s eights and two women’s quads provided us with an exciting day’s racing. The UL Men’s 1st Eight saw recent world champions Paul BENNETT, Nathaniel RIELLY-O’DONNELL and James FOX team up with fellow GB squad member Ollie COOK and current UL men’s squad athletes Rich CLARKE (Brunel) and Matt BEDFORD (University College London), Ed SURMAN (Birkeck) and James RICHARDS (Kings College London). The crew was coxed by Matilda HORN. The eight captured the bronze medal in a close fought final, behind well-drilled crews from Oxford Brookes and Leander Club. After coming a solid third in the time trial, the guys really pushed on to win their semi. The crew had high hopes coming into the final, and despite having similar mid-race pace to the other crews, didn’t quite have enough to secure Gold. This was the club’s first medal at the new look Senior Champs. The UL Women’s 1st Eight featured GB rower Fran HOUGHTON along with seven current students. The final featured UL alongside both Oxford and Cambridge along with Oxford Brookes and Newcastle, and an IC line up of mainly GB Squad members. The UL crew stayed competitive throughout finishing in an impressive 5th place,. 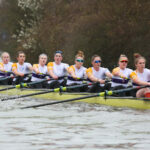 The UL Women’s 1st Quad had a strong crew line-up with lightweight world silver medallist Emily CRAIG, fresher and recent Junior World Championship medallist Charlotte HODGKINS-BYRNE (Royal Holloway) along with established UL Women’s Squad members Ally FRENCH (Birkbeck) and Suzi PERRY (BPP). After an excellent 4th place finish in the time trial they were excited about what the day might bring but an unfortunate double crab in the semi-final left them in the B-final. All credit to the girls for bringing it back and rounding off the day by dominating the B-final with a strong victory. A 2nd UL Women’s Quad also raced, and despite being hit by illness the day before the scratch crew raced well, eventually securing a 2nd place finish in their D-final in what was a very competitive event, especially at the top end. A further three UL Men’s eights also raced. A crew made up of Returners from last year’s squad narrowly beat the UL Men’s Freshers Eight in the time trial. This meant the Freshers Eight found themselves in the C/D semi, but won both their semi and C final convincingly. A hugely encouraging performance from a group who only joined UL a month ago. The Returners crew eventually found themselves in the B final, and finished 4th, beating both of Newcastle’s entries into the eights event. Another very strong performance. The other UL eight, made up of Masters students and Gap Year rowers, improved with each performance of the day and made the C final alongside the Freshers, and put in a great effort to overturn a crew from Oxford Brookes. A huge positive from the day was the performance of both the UL Freshers Men’s Eight and Freshers Women’s Eight. The Women’s eight raced very well through the day and ended up being in possibly the closest final of the day, with five crews within 2.5 seconds of each other. 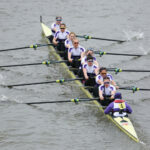 This eventually placed the crew a commendable 5th place finish in the University Eight’s category.